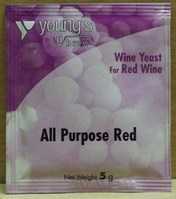 An all purpose red wine yeast suitable for any style of red wine. This all purpose red wine yeast is suitable for all styles of red wine and produces red wines which are well rounded and full of fruit flavours. To use, simply sprinkle onto the surface of the wine and wait for 15 minutes before stirring to disperse the yeast. It is suitable for up to 5 gallons.